Korean Beauty Products are something of a rarity in the UK, they’re just so difficult to get your hands on. So when The Silk Rose got in touch and asked me to review some of the Korean products that they were making accessible to the UK, I jumped at the chance. The Silk Rose were so kind and sent me a range of products that I’ll be reviewing individually this month. 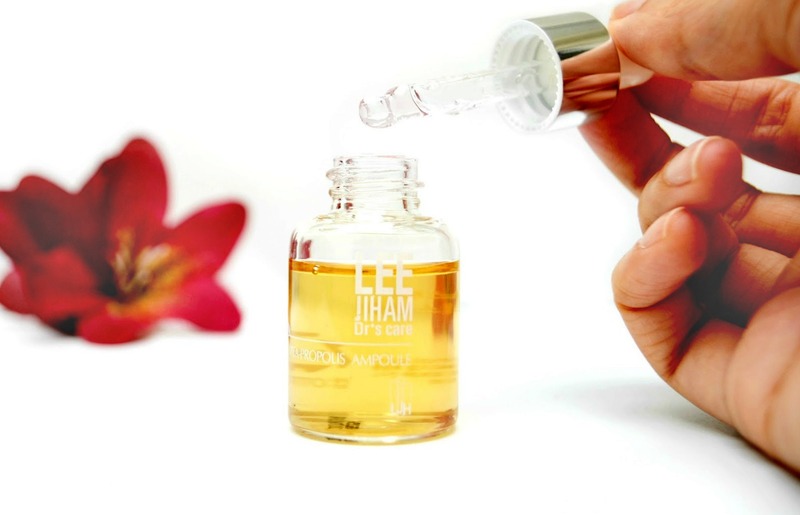 The first product I’ve been using religiously for the past few weeks is Lee Ji Ham Vita Propolis Ampoule. I’ve been getting on really well with dry oils so I was keen to see what this one was about. This product is a multi-tasking, glow-inducing serum, consisting of 50% propolis extract and 20% multivitamin nutrients. I’ll be honest, I had no idea what propolis was so I did a little research before I used it. It turns out propolis is one of the most powerful natural shields there is. It comes from bees, which use it for sealing cracks, sanitizing, reinforcing and protecting the hive. If you’ve ever seen a beehive before you’ll know just how strong they are. Propolis is now often used in health and beauty products because it promotes healing. Since I have acne scarring, I was interested to see whether there would be any difference to how my skin looks. 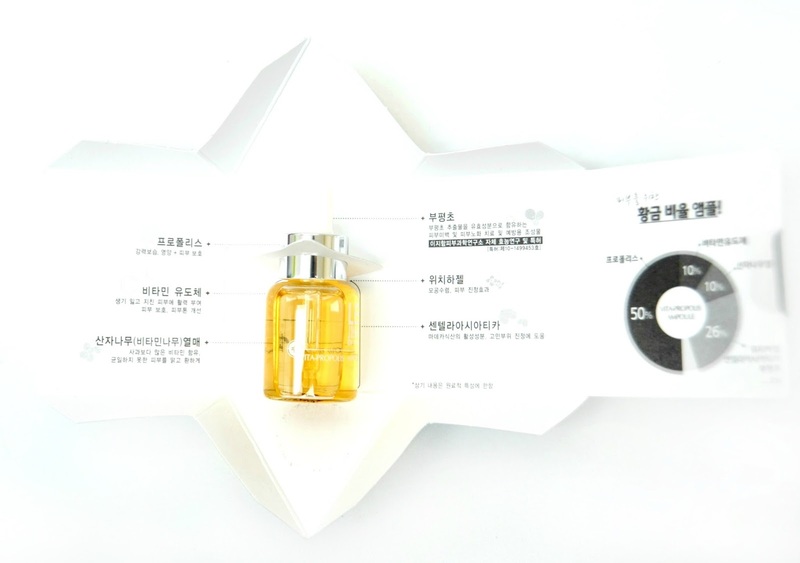 The product comes in a small clear bottle with a dropper lid. I love these, because it allows you to make the most of the money you’ve spent without wasting any of the product. The oil itself is a honey colour with a very watery consistency. The smell is beautiful, it’s a very faint smell almost reminding me of aniseed. If you’re not a fan of that smell then you’re in luck because when you put the oil on, you don’t notice the smell at all. In comparison to other dry oils I’ve used this one is a lot lighter in consistency. When you press the dropper you’ve got to be a little careful because a lot of it will fall out due to how runny it is. I really like the consistency though, it’s easy to work into your face and it soaks into my skin really easily. It’s not greasy at all, and I’m not left looking really shiny after use too. A little goes a long way too, just 2-3 drops of this will be enough to cover my entire face. It is has been recommended that we use a moisturiser after using the serum to seal the Vita Propolis in. I wasn’t sure how I felt about this but I did it anyway once the ampoule had properly dried. I found that I was waiting around a lot so instead I realised that I could actually just mix a few drops in with my cream moisturiser and it still worked the same way. This method works brilliantly and I like that I’m adding pure goodness to something that I already know works well for my skin. Since I was testing the product on it’s own though, I decided to go back to using it on it’s own followed by a moisturiser as recommended. A month on and honestly, no exaggeration at all, my skin looks so much healthier. That’s the only way to describe it. Winter usually means my skin looks very dull and as much as I hate to admit it, it looks kinda haggered but I’ve been surprising myself every time I look in the mirror at how good my skin looks. I feel like there has actually been some improvement on some of the smaller acne scars on my cheeks. If it really is this oil that’s making a difference then I’m definitely going to be stocking up on it. Antibacterial, anti-fungal, anti-viral: Propolis is known for its ability to fight against a lot of powerful bacteria. Some studies conclude that the reason propolis is so effective against various microbes is because it’s so rich in flavonoids (you know, the same antioxidant found in coffee). Smoothing and softening: Since propolis has such powerful healing properties, it works quickly to regenerate skin to help make skin texture smoother and suppler. Moisturising: Yes, it even hydrates skin without a creamy, heavy residue. Soothing: Because of the healing abilities, propolis is great for sunburns; it soothes and helps to speed up the recovery process. Free radical fighting: Propolis is also packed with antioxidants, helping to keep free radicals (which are an almost inevitable reality with everyday pollutants and sun exposure, even if you’re an avid SPF user) from causing cellular damage. Controlling oil production: Overactive sebaceous glands could be helped by the bees as well. Thank you, bees! I’ve been using Lee Ji Ham Vita Propolis Ampoule for about a month now and there’s still quite a bit left. Initially I was a bit unsure about the £22 price tag but a little does go a long way. I have sworn by Trilogy Rosehip oil for the past few years but I really think I’ve found my replacement. I will definitely be purchasing this once I’ve run out. I have sworn by Trilogy Rosehip oil for the past few years but I really think I’ve found my replacement. Buy this product and more genuine Korean products on The Silk Rose’s website.